Biotech | Can the dilemmas of kidney transplantation be resolved? For Christians? An Organ Donor Bill of Rights and the Living Donor Advocate are also in the mix. The Organ Donor Bill of Rights was penned by Nancy Scheper-Hughes, who has stated, “If you were able, as I have been, to talk to kidney sellers the world over, you would find that even years after the operation, the sellers are still suffering from its effects on their bodies, minds, social status, intimate relations, and working lives.” She hopes this Bill will be read by the body brokers. There are no ‘spare’ kidneys, lungs, or part-livers. To share these human parts is a sacrifice not to be normalized, routinized, or taken lightly. Although living donation is honorable and ethical, it is never to be presented by the recipient or his surgeons as an obligation. Green donation (deceased donors) should be the default system. Red donation (living donors) should be viewed as the exception, not the rule. Acknowledge that vulnerable populations – young people, the unemployed, prisoners, the mentally ill, the mentally deficient, guest workers, the uninsured, economic and political refugees, those in debt – are exploitable and that the ‘choice’ to sell a kidney is often coerced. Recognize the role of relative power/powerlessness based on gender, race, class, education, citizenship, nationality in organ selling, transplant tour, internet brokering schemes. Establish a principle of solidarity with the weak, the frail, the sick and the economically and existentially shaken. Recognize that the medical, psychological, social and political consequences of kidney selling, like the scars themselves, are often kept hidden from view. Revise hospital protocol to increase surveillance of living donation to include a ‘donor’s doula’, a guardian-advocate at the bedside, independent of and un-beholding to, or financially dependent on the transplant team, to represent the living donor during screening, surgery, and post-surgical follow up. Scientists removed the cells from a rat kidney, leaving only its collagen scaffolding, then re-seeded the scaffolding with neonatal kidney cells and endothelial cells, producing a functional man-made kidney that, when transplanted into rats, filters waste and produces urine. It raises hopes for a bioengineered human kidney. The referenced article also mentions at-home and portable dialysis as new techniques, but stresses that one new kidney is what frees patients from devices. The prospect for growing kidneys in labs using stem cells from human embryos or for developing inter-species kidneys for human transplant are real, yet these are not expected to be on the market anytime soon. Would you want to have a kidney that came from a pig? Many people have porcine (pig) or cow heart valves in place of their own and may be considered chimeras, yet there is a significant difference between a man who has a pig valve in place of his own faulty valve, and animal embryos merged with human in a petri dish to invent a chimeric kidney or other body part. Animals have long been incubators for human medical advancements, but where do you draw the line? 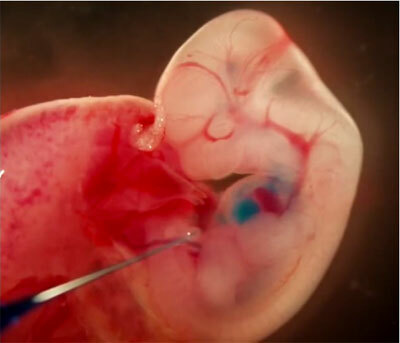 For the Christian, the line is drawn at using human embryos in research. Life begins at conception. This is a scientific truth that, like the definition of death, is now disregarded. It is rejected by those who desire to use human embryos “for the greater good.” An excellent article that explains why life begins at conception is here. Also, for the Christian, there should be no acceptance of fusing the types or “kinds” that God created, but regenerative therapies may hold promise, and these, I believe, could meet with Christian approval. What other lines should a Christian draw? We cannot steer the sciences but we should have our own insights and convictions to live by and to share as we may feel led.